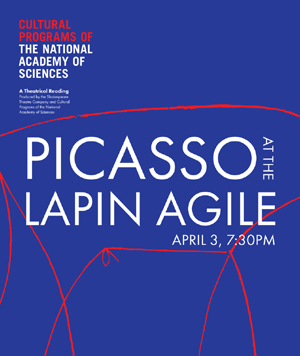 Join Cultural Programs of the National Academy of Sciences and the Shakespeare Theatre Company for a free staged reading of Picasso at the Lapin Agile. The popular Off-Broadway hit from the brain of comedian and writer Steve Martin brings Albert Einstein and Pablo Picasso together for a fictional meeting in 1904 Paris. The comedy sparkles and reaches absurd heights as it discusses genius, distraction, and the ideas that will shape the century. Directed by Samantha K. Wyer, Director of Education, Shakespeare Theatre Company. Featuring Sam Ludwig, Matthew Magee, Kelsey Rainwater, and Scotland Newton. The performance runs 90 minutes and does not include an intermission.